I was wondering if there was any was I could right click inside any instance of a "Finder" window such that I have an option that says "Open Terminal Here". It would be really helpful. As of Mac OS X Lion 10.7, Terminal provides Services for opening a new terminal window or tab at the selected folder in Finder. They also work with absolute pathnames selected in text (in any application). You can enable these services with System Preferences > Keyboard > Keyboard Shortcuts > Services. Look for "New Terminal at Folder" and "New Terminal Tab at Folder". You can also assign them shortcut keys. In addition, you can now drag folders (and pathnames) onto the Terminal application icon to open a new terminal window, or onto a tab bar in a terminal window to create a new tab in that window. If you drag onto a tab (rather than into the terminal view) it will execute a complete cd command to switch to that directory without any additional typing. As of OS X Mountain Lion 10.8, Command-Dragging into a terminal will also execute a complete cd command. The solution to your troubles is called Go2Shell and it does exactly what you're describing. You can find it on the App Store and best of all... it's totally free. A different approach: DTerm, which gives you a floating command prompt at the top of the window. This works in many apps, not just Finder. cdto seems like it is just what you need. It is a mini-application, designed to be put in the Finder's toolbar, when you run it it will open a terminal window and cd to the current directory in Finder. 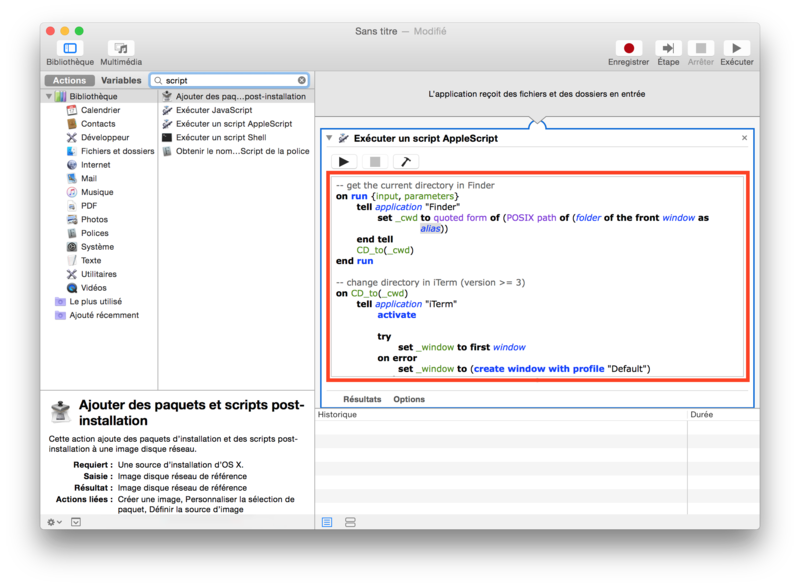 For those using iTerm, the AppleScript syntax has change in iTerm version 3. 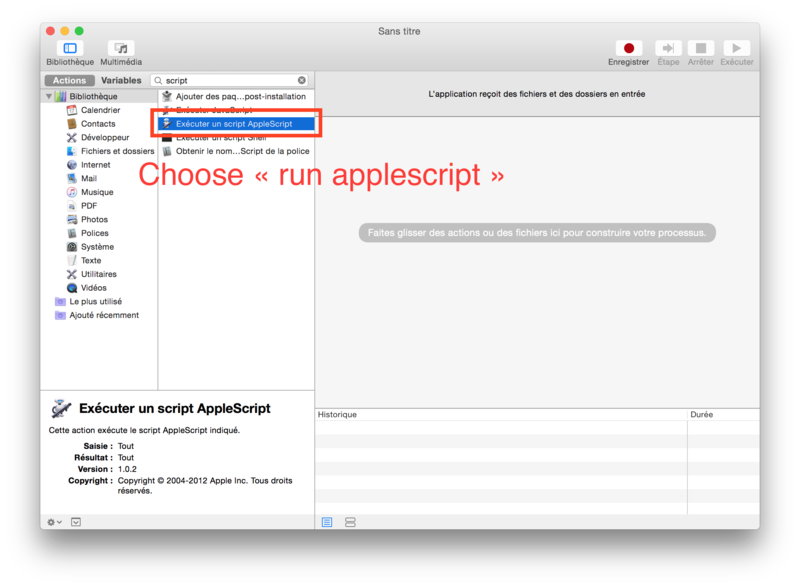 Here's the full procedure to follow to create a shortcut in the Finder. write text "cd " & _cwd & ";clear;"
Click "File" -> "Export" to export as an .app, save it in /Applications. 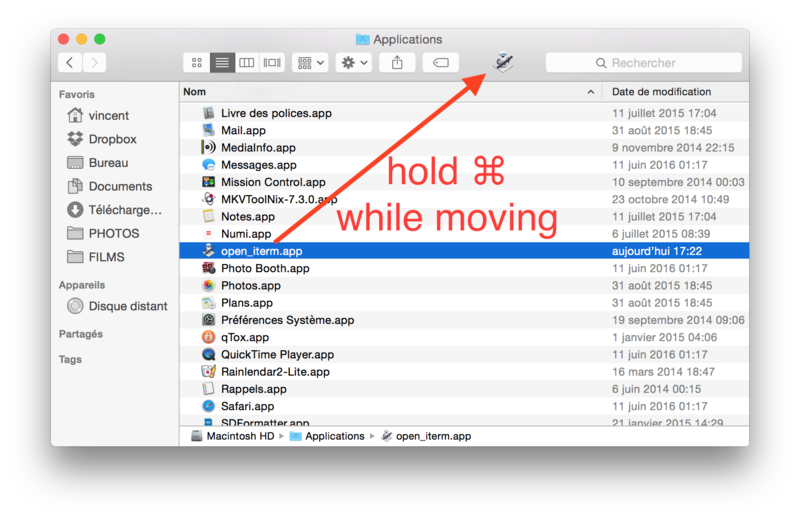 You can change the icon in the Finder by following the instructions here (change the icon of the application you created with Automator). cd "$(osascript -e 'tell app "Finder" to POSIX path of (insertion location as alias)')"
You could also assign a shortcut to a script like the ones below. As of 10.9, there is a bug where services that receive folders as input are never listed in the services menu in column view. If you assign the New Terminal Tab at Folder service a keyboard shortcut, it doesn't work in column view. They use the folder on the title bar instead of requiring you to select a folder first. They reuse the frontmost tab if it is not busy, e.g. running a command, displaying a man page, or running emacs. There is a bug in 10.7 and 10.8 (but not in 10.9 or 10.6) where Finder ignores windows created after the last time focus was moved to another application and back when getting the insertion location property. You can do this with the service feature. You can drag any file or folder from the finder onto a Terminal window to insert a string of said file or folder's absolute path. This will work on any standard install (at least back until 10.4 Tiger [¿maybe earlier?]) without needing additional software our twiddling of preferences, either of which may later freak out your non-techy friend if it happens to be his/her Mac that you’re working on. This trick also works for any process that is running in the Terminal, e.g. emacs or vi (assuming you’ve got vi in the appropriate mode, or however it is that you people who use vi do). It works with the Finder's sidebar items, multiple folder/file selections and anything you could think of. Really easy to use! 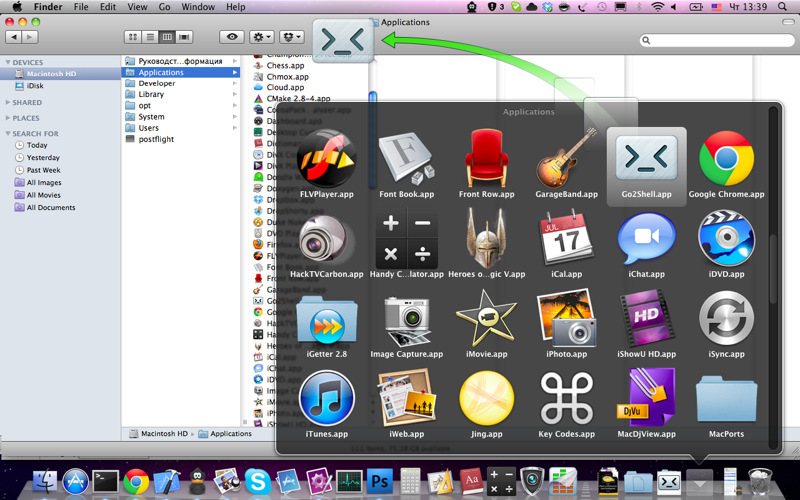 I don't know whether it can be reached through a contextual menu, but I keep ShellHere in the toolbar of Finder. Installed and used by me on Snow Leopard before upgrading to Lion. Too soon for me to say whether version 2.3 is compatible with Lion. How to open terminal from within a folder using contextual menu? 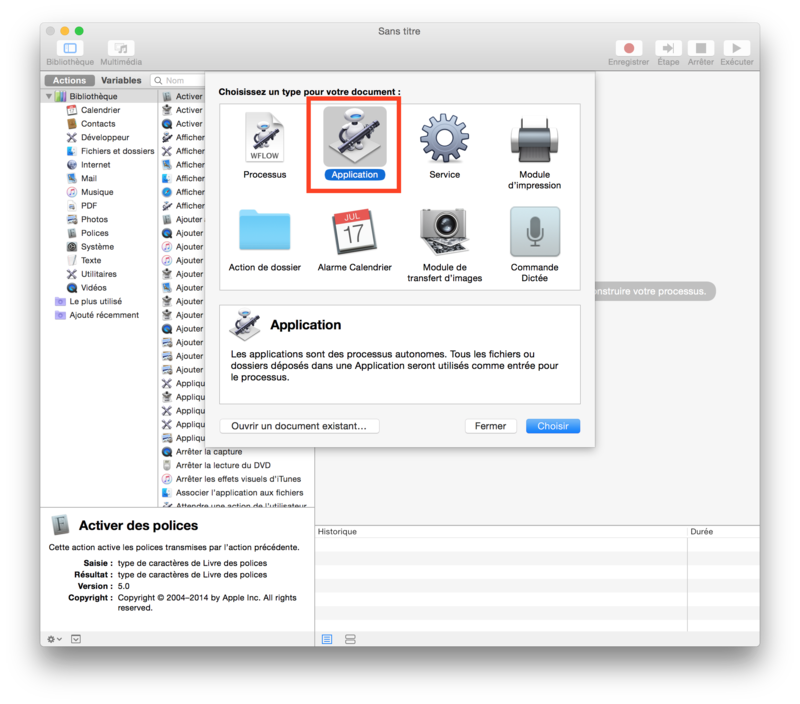 Can I change the application icon of an Automator script? How to use “open in terminal”, and “two windows side by side” on mac?